Deep in the mountains of Alaska, Amanda Reid's family of six gathered around a campsite, enjoying the solace of nature at twilight. The silence was broken only by a wolf howling somewhere in the distance. As they got ready to roast marshmallows, their faces were illuminated by the soft glow of...Reid's laptop screen. For the past two years, Reid has been a full-time online student in St. Scholastica's master of science in Project Management program. She's taken her work with her everywhere. "I've literally been all over the country, and working on this no matter where I am or what's going on," said Reid, who lives in Maine and works as the director of coding and clinical documentation improvement at Eastern Maine Medical Center. She said her degree will help her navigate some big changes on the horizon at work. Reid is just one of 119 online students at St. Scholastica who never set foot on campus until they came to Duluth for commencement festivities this May. From all over the country (and beyond) and in different life stages, they represent the evolving face of today's St. Scholastica student. Admissions numbers reflect a trend in higher education enrollment, as traditional undergraduate populations are leveling off while non-traditional enrollments are growing. During the Spring 2016 semester, St. Scholastica enrolled 1,050 graduate and extended campus students, 1,328 online students and 1,758 traditional undergraduates. All the way across the country in California, Melissa Sather '10 also completed her online master's in PM. She earned her undergrad in advertising and public relations at St. Scholastica, and works in the Integrated Marketing Department for a Los Angeles global media company called Fullscreen, Inc. As she anticipated the commencement ceremony, among the things she was most looking forward to was some good old Duluth tap water. After all, you can't get that in L.A.
"I wish I could just take gallons of it back with me," Sather said. Since a graduate degree in project management is rare in her field, Sather is excited to see how it will make her stand out from her competition. Meanwhile, back on the east coast in Savannah, Georgia, Shannon Davis also has big plans for her future now that she's completed her online bachelor's in HIM. "I have a three-year plan," said Davis, who currently works with dialysis patients. "I would like to get into a good HIM department at a hospital, and I want to work my way up. My ultimate goal is to be director of the program." She was thrilled to walk across the stage to officially receive her well-earned degree. As a single mom working full time, making the time for her education hasn't been easy. "It was a long hard road, and I'm such a non-traditional student because I've been taking two classes here and there, maybe three. I'm looking forward to everything coming to an end and getting in its place." Mujeeb Kandy and Jeanie Scott are completing their master's degrees in HIM and Health Informatics, respectively, but other than their career fields, they probably don't have much in common. Scott lives in upstate New York, while Kandy lives on the Persian Gulf peninsula of Qatar. Despite the fact that he is eight hours ahead of Duluth, he was amazed by his professors' responsiveness. "It has been a great learning experience for me," said Kandy, who works at the corporate office of Primary Health Care Corporation as head of Medical Records and Data Abstraction project manager. He and his team are working on a new electronic health records system for 23 primary health centers managed by PHCC and six hospitals managed by Hamad Medical Corporation. "The CSS program is really special and it is really quite more than an online course." In an interview with the Duluth News Tribune, Kandy and Scott noted how they felt part of the St. Scholastica community even from afar. "You feel like it's a real college and not only that, there's a lot of discussions and interactions," Kandy said. "There's a lot of opportunity for interaction between classmates." 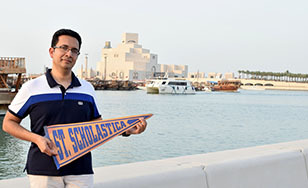 "What (St. Scholastica) stands for in its teaching beliefs and its learning beliefs made me want to come and see it. Maybe in another school, I would have felt like one of 10,000, but the small personalization here makes you definitely want to come be a part of the inclusive community," she said. Scott found the program accessible for her busy schedule, and appreciated the assistance of her advisor, Laura Munson. "Most of the classes are very well laid out," said Scott, who works in the Health Informatics division of the Department of Veterans Affairs. "Laura was an absolutely amazing adviser; she really kept in touch with me throughout." Scott said she's already been able to apply many of the new things she's learned in the program. Gerlie Matahum came all the way from Hawaii for her graduation from St. Scholastica's online doctor of physical therapy program. "It's really enhanced my knowledge and skills because I've been out of school for 15 years," said Matahum, a physical therapist at the Veterans Health Administration in Honolulu. She was drawn to St. Scholastica because of its Catholic heritage and mission - and because of its flexible online program. But in the end, even in the era of fast-changing technology and internet-based learning that allows people to complete their degrees completely online, it was old-fashioned customer service that convinced Matahum to enroll in St. Scholastica. "CSS was the first school to return my call," she said.